Fundamentally commodity options work the same as stock options. Both give the buyer the right but not the obligation to purchase or sell at a per-determined price during a per-determined time frame. However, inherent in commodity options are numerous advantages the main ones being: margin, diversification, implementation of strategies and fairer pricing. The commodity markets utilize SPAN*, Standardized Portfolio Analysis of Risk. SPAN is a risk based, portfolio approach for calculating margin requirements in an account for futures and options on futures. Instead of calculating the margin on a new position placed in an account SPAN calculates the effect the new position has on the entire account. The current margin to trade a futures contract on December Gold is $5280. The margin to write (sell) two December 1500 Gold calls is $2609. However, if they are executed in the same account instead of the margin being $5280 + $2609 = $7889 the overall margin is reduced to $5001. SPAN recognizes that in order for the 1500 calls to go in the money the futures contracts would have to gain over $2800. The real advantage becomes apparent with strangles or straddles. Once the call side of the spread is established and the margin is determined, assuming the put side is the same percentage out of the money with similar volatility, no additional margin is required to form the spread. SPAN recognizes that only one side of the spread can lose at a time. In comparison margin methods in the stock market are archaic. An investor must meet full margin on the call and full margin on the put. A more compelling example occurs when a portfolio is long silver, long gold and long palladium. The required margin is $20,240. The margin on one platinum contract is $2585 but if we short a platinum in the above portfolio SPAN recognizes the overall risk factor of the portfolio has diminished and the resulting margin is reduced to $19,214. On the equities side if you own Volvo, Ford and Daimler Chrysler and decide to short General Motors you have to commit more margin to the account because in the eyes of the New York Stock Exchange you are increasing your risk, when in reality you are decreasing your risk. The exchange does not recognize any correlation. *SPAN is a registered trademark of the Chicago Mercantile Exchange. Correlation is one important factor in our next advantage diversification. Many investors have an erroneous belief that they are diversified because their stock portfolio consists of pharmaceuticals, defense, mining, transportation or various other sectors. However, if the Dow Jones Industrial Average falls 400 points and decliners lead advancers by 4 to 1 what kind of real diversification do you have when 80% of stocks fall? When stops are triggered and a fund manager sells he generally does not liquidate distinct sectors. In commodities the positive correlation is nowhere near as prevalent. Cotton is not influenced by Gold and Live Cattle is not influenced by the Japanese Yen. As a net seller of options this is an integral part of the equation. We are able to weather a storm in a particular sector without having the same storm effect every position in a portfolio. The implementation of strategies is another advantage commodity options have over stock options. Using stops in commodity options is done to hopefully limit losses or protect gains, very rarely can this be done on the stock side. Try to find a specialist who will take a stop, watch it and be responsible for its execution. In fact in commodities we have established personal relationships with floor brokers and traders on all major exchanges for options. This just does not occur on the stock side. In the commodities market you can place a stop to try and limit the loss while remaining in the position hoping for market reversal. Because of the favorable margin situation you may be able to go long the futures on the underlying commodity option. Depending on the situation this can actually lessen your risk as well as margin. 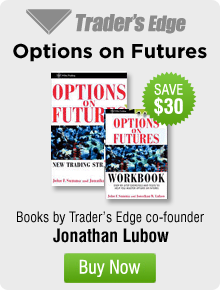 In the case of naked put options, traders in stocks have even fewer methods to employ. To protect his puts if the market starts to drop he would have to sell the stock. On the short side the margin can be overbearing because of the unlimited risk associated with shorting a stock. In cases where the client can handle the margin another problem often exists. There may not be shares available to short. The brokerage house may not have shares in inventory or the ability to get the shares to short. Many times this precludes people from selling short. The fourth and final advantage of commodity options is the overall fairness of the market. No one has ever been prosecuted for insider trading in commodities. It doesn’t exist because all of the reports are government reports. 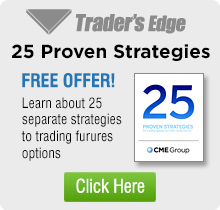 An important aspect of option trading is to determine the “true” value of an option. This means what you believe the options value should be compared to where it actually is trading. Without getting into historic volatility, implied volatility or the Black-Scholes model suffice to say overvalued options should be sold and undervalued options should be bought. If the market is not unfairly skewed due to manipulation option evaluation is possible. Commodity Options can be overvalued because of many things, volatility, weather, and impending reports to name a few. However, such is not the case with stock options. Unfortunately inside information can be a factor in the overvaluation of options. If a firm is going to acquire over 10% of another publicly traded stock, they must file with the N.A.S.D. (National Association of Security Dealers). This requires the board of directors to vote, auditors to analyze the merger or acquisition, accountants to file reports, secretaries to type up the proposal.etc. Clearly information can and is leaked at times. The Security and Exchange commission is aware of this, but if the slippage is minimal nothing happens. But what happens to the investor who is pricing a $45 call on a $40 stock and his analysis tells him the options are severely overvalued. He sells the calls and collects the premium believing he has seized the opportunity through accurate options valuation. What he does not know is an offer will be made to acquire the stock at $52 within the week. Unfortunately, someone on the inside created excessive demand by buying the options and artificially inflating the price. These are some of the major reasons why new commodity exchanges keep opening with never traded before commodities. Since the implementation of SPAN, open interest and volume has increased. As more people explore the advantages of commodity options expect this trend to continue.